A rendering of the plans for the Hunters Point Library Branch of Queens Library, by architect Steven Holl. HUNTERS POINT — Opening of the neighborhood's long-awaited new library branch has been delayed again, this time because crews are waiting on a shipment of specialized glass coming all the way from Spain, according to city officials. The Hunters Point Library, which has been under construction on Center Boulevard and 48th Avenue since 2015 after years of planning, hit another snag recently after a labor strike in Spain delayed the glass order, according to minutes from a meeting of the Queens Library's Board of Trustees on April 27. The delayed glass shipment will set the project back six weeks, and Queens Library staff now say the branch might not open its doors until early winter of 2017 or early 2018 — a far cry from the 2014 opening date officials predicted when dedicating the site four years ago. The glass that crews are currently waiting on was ordered from a company based in Connecticut, which had the glass manufactured in Germany and then glazed in Spain. It's being sent to New York on a cargo ship. 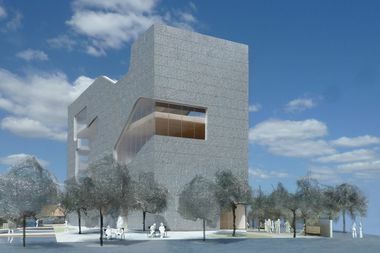 This isn't the first hold-up for the future branch, which was designed by acclaimed architect Steven Holl and will be the first library location on the burgeoning Hunters Point waterfront. The $41.5 million project hit delays in 2014 when its first round of construction bids came in millions of dollars over budget, forcing planners to ax some of the building's elaborate features, including a $750,000 "geothermal heating and cooling system" and a $1.4 million aluminum facade. At the time, former Queens Library president Thomas Galante blamed the budget mismatch on the "complexity" of the new building's design. Galante was fired from his post later that year after several investigations into his spending habits. The city's Department of Design and Construction, which is in charge of the Hunters Point branch project, expects to finish construction on the new building in September, according to a spokesman. It will then be turned over to Queens Library, which will spend another four months readying the branch to open to patrons, library spokeswoman Elisabeth de Bourbon said. In the meantime, a mobile library bus will be parked at the future site of the Hunters Point branch on Sundays at least through the summer. The next closest Queens Library location is in Court Square. City Councilman Jimmy Van Bramer, who represents the area, blasted the DDC for the opening delay, saying the agency is "unable to adhere to timelines they themselves set." "The Department of Design and Construction (DDC) has failed to do their job, which is to spend taxpayer dollars wisely and deliver to our community the library it deserves on time," he said in a statement Tuesday. The councilman plans to hold a city council hearing to specifically look into DDC construction delays for libraries and cultural facilities, he added.